This might look familiar. This, too. And that. Update: We are now mercilessly slaying zombies live on Twitch! Check out the stream right here. Dead Island was good, and Riptide is basically the same game, which makes it good by proxy, right? Right? Well, not exactly. It's not bad, strictly speaking, but I understand that it's nothing to write home about. If you've been loving the experience, or in case you were disappointed with your Riptide purchase, or even if you're on the fence about taking the plunge, you'll do well to check out our live stream on Twitch.tv at 4ish o'clock Eastern time today. Not only will you get to see Riptide in all of its zombified grotesqueness, you'll also get to hear the witty banter of your favorite Editor-in-Chief and mine, Susan Arendt, alongside The Escapist's Managing Editor, Mike Wehner. Our co-op stream will go live promptly at 4ish Eastern time, give or take a few minutes, at which point you'll be treated to multiplayer zombie slaying at its finest. Chat up your favorite editors in the Twitch.tv chat, or just lurk like yours truly and take in the tropical scenery. Not familiar with the series? 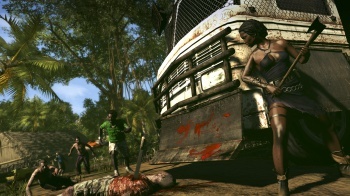 Dead Island was something of a phenomenon back in 2011, and it was good. From the first glimpse of the emotionally wrenching trailer, the internet was abuzz, and the hype never really went away. Ultimately boasting more than five million copies sold, a sequel was all but assured. Almost two years later, Dead Island: Riptide captured the interest of the internet, thanks to the Zombie Bait fiasco. Just as the press leading up to Riptide wasn't nearly as positive as it was for the original, review scores have similarly failed to keep pace with its predecessor.